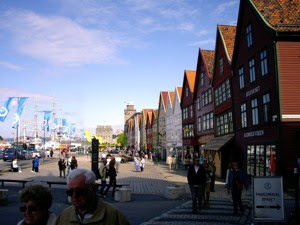 Bryggen, or Tyskerbryggen (The German Wharf), is maybe the biggest attraction in todays Bergen, and listed on UNESCOs list for world heritage sites. 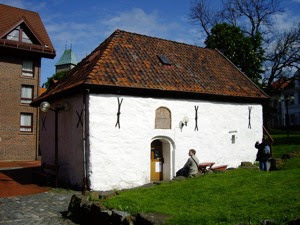 It used to be the merchant offices of the traders of the Hanseatic league, that founded an office in Bergen in 1370. From here their influence grew, and this northern outpost of the Hansa empire enjoyed close tradelinks with other Hansa ports as Bruges, Lübeck, Danzig, and Hamburg. They brought their building traditions with them as well, with rows of buildings with gabels facing the water and long back buildings where they stored dried fish, cereals or other commodities for trade. When you enter the narrow passage between the long, narrow houses you enter a completely other world. The passages are wooden board walks. The warehouses still bear the small roofs where the lifts used to get the merchandise from the ground level up to the different warehouses. Along the side of the houses you have open passages from which you can move along the floors of the long houses. You are amazed by this strange world that is long gone and if you try, you can nearly imagine the busy life that once took place among these beautiful houses. Bryggen is not a museum, it is a living part of Bergen. In the old houses you find galleries, shops selling handcrafts, offices and restaurants. 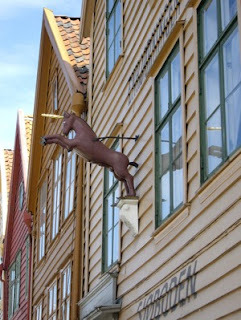 My favourite house is Enhjørningen (the Unicorn). Here you find one of the most famous restaurants in Bergen. Enhjørningen is a very exclusive and pricy restaurant. It is the ultimate place for a romantic dinner, and here you may feast from the abundance of fresh fish, shellfish and crusteacae from the cool waters of the west coast. You can choose from the menu. Here you can get starters from €15, and main courses, prepared anglerfish, wolffish, cod, or salmon. The price of a main course varies from €30-35. Or you can order a three course menu at €60 or a four course dinner at €65. And remember wine, beer, and drinks are not included. It is a steep price, but I have never had any regrets from the time I had fried catfish with a sour cream sauce here some years ago. The food is great, the interior and charm of this place makes it a perfect venue for a romantic dinner. 6 of the houses burnt down in 1955, but has been rebuilt and incorporated into this new part of Bryggen you find Radisson SAS Royal Hotel, a luxury/business class hotel. I have stayed there once, and it was a great experience. Some buildings, as this stone cellar, predates even the large fire in 1702. This cellar was built in 1666 for the Merchant Arent Meyer. Today it house Bryggen Art school. 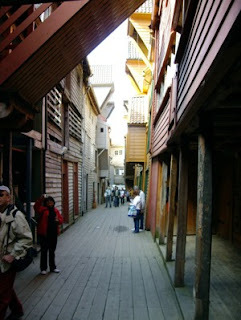 A walk at Bryggen is the thing to do, when visiting Bergen. 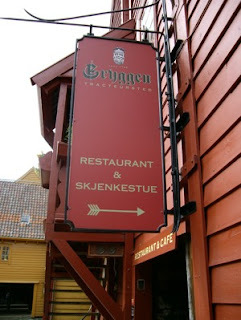 And when you are through you can sit down and enjoy a pint of beer at Bryggen Tracteursted, Anno Domini 1702. We did, and that is truly one of the best experiences I had during that week. A dripping cold pint of the local brew, appropriately named Hansa in memory of the Germans that left this beautiful quarter for us to see.